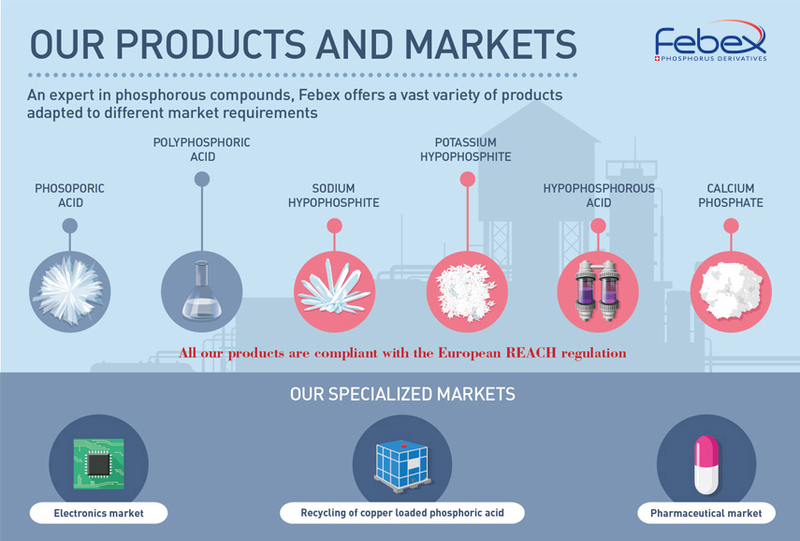 Febex produces technical raw materials based on phosphorus, designed for numerous worldwide niche markets. Particularly oriented towards the electronics market, Febex products are of extremely high purity and of a reliable and consistent quality. 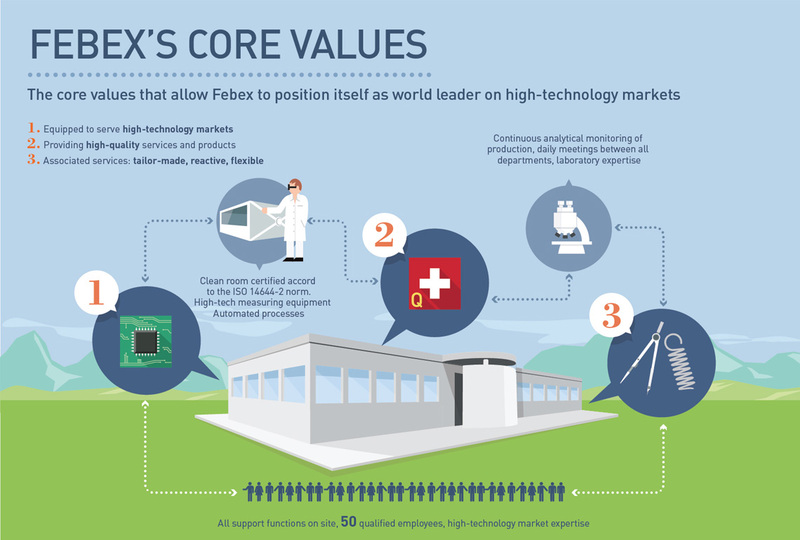 Its core values make Febex one of the major actors on its markets. Febex has been present in the chemical industry for 100 years, and has adapted to the markets’ requirements over the years. Production methods developed over time have enabled the evolution of commodity products towards top of the range premium products. Today, electronics are at the heart of Febex’s activities. The services associated with its range of products, Febex’s core values, bring a considerable added value. 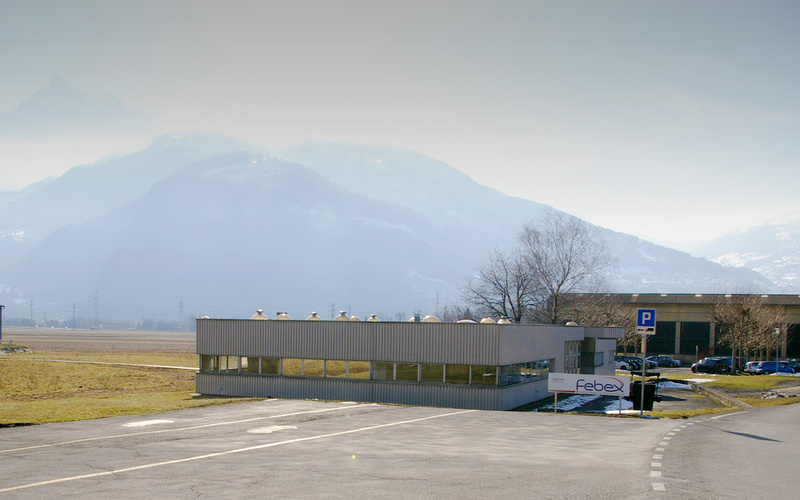 Febex is part of CECA since 1976. CECA is a business unit of the Number One of the French Chemical Industry Arkema group. Febex manufactures a wide range of high quality Pyrophosphoric and Polyphosphoric Acids. Our Polyphosphoric Acid ranges from 102 to 118%. It is a hygroscopic, viscous solution, whose mainstream applications are in organic synthesis, in the polymer industry and in the fine chemical industry. Of a higher quality than those generally produced on the market, the purity of our pyro/polyphosphoric acids is the result of strictly controlled sourcing and manufacturing processes. Polyphosphoric acid is produced from phosphoric acid by means of a polycondensation reaction, during which the phosphoric acid forms chains by eliminating water molecules. Its concentration is generally indicated in monomer equivalent, from 102% to 118%. It can also be expressed as a P2O5-equivalent from 73.5% to 86%. A distinction is made between pyrophosphoric acid with a concentration of 102% to 109% and polyphosphoric acid with a concentration of 110% to 118%. Polyphosphoric acid is a polymer according to REACh ((CE) N°1907/2006, Article 3). The product obtained is viscous and hygroscopic. 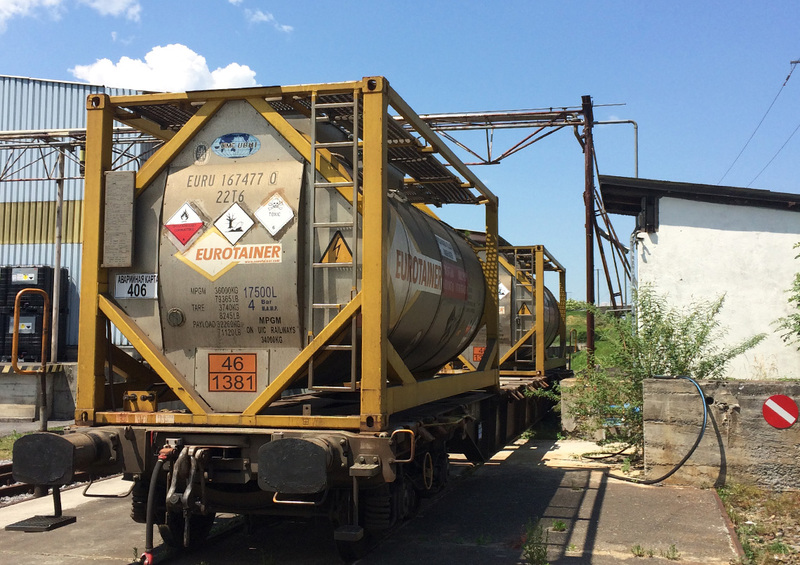 The superior quality of our pyrophosphoric and polyphosphoric acid is greatly appreciated on our markets. We master the quality of our raw material because we manufacture it ourselves. Our phosphoric acid is extremely pure, thus limiting contamination by impurities. Furthermore, we use dedicated equipment for production. Polyphosphoric acid can be used as a catalyst or as a dehydrating, condensation or cyclization agent in organic synthesis. Polyphosphoric acid enables chemical and electrolytic polishing on steel, titanium or aluminum based metal pieces. The phosphate polyols used in the manufacturing of these foams can be produced from polyphosphoric acid. Potassium hypophosphite was developed by Febex as an alternative to Sodium Hypophosphite. Its improved solubility is greatly appreciated for application in electroless metal plating. The synthesis of Potassium Hypophosphite was developed to meet the requests of our clients. As an alternative to Sodium Hypophosphite, this salt offers improved solubility. The industrialization of the process took place in the second half of 2014. Potassium Hypophosphite is characterized by its superior solubility compared to Sodium Hypophosphite. Sodium Hypophosphite allows the dissolution of ~810 g/L, while with Potassium Hypophosphite a solution >1000 g/L is possible. This property is of great value for electroless metal plating, extending the finished product’s operating life. The meticulous selection of our raw material begins with a strict approval procedure. In conjunction with a rigorous control of our laboratory, we are able to guarantee quality and stability. Hypophosphorous Acid is a high purity reducing agent that is ideal for numerous fields of application including the pharmaceutical industry. 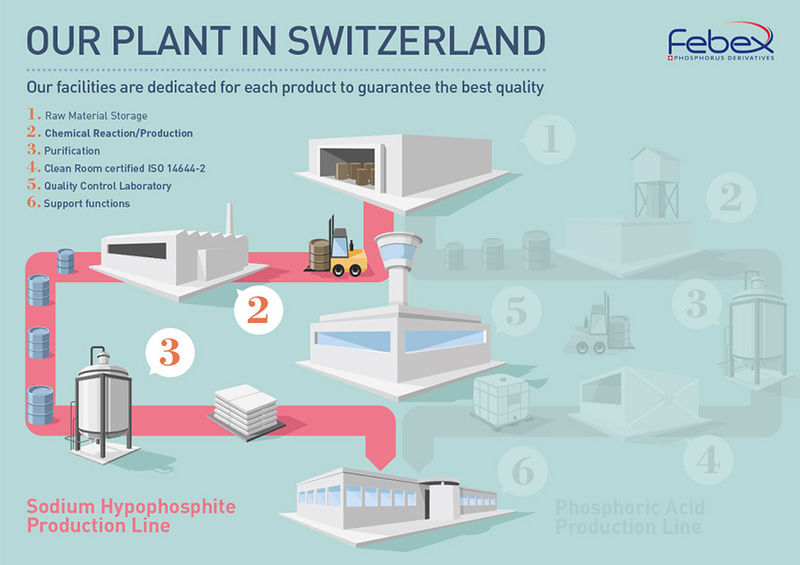 Manufactured from Suisse Febex’s Sodium Hypophosphite, our hypophosphorous acid is monitored throughout the entire value chain. With its pharmaceutical and technical grades, Febex caters to different markets for applications with specific requirements. Hypophosphorous Acid (HPA), chemical formula H3PO2, is produced from our Sodium Hypophosphite, manufactured in Switzerland (NaH2PO2). The obtained HPA water solution has a concentration of 50%. The reaction consists in replacing the sodium (Na+) with an H+ proton by means of an ion exchange column. We ensure the quality of our product throughout the entire value chain, from the raw material to the finished product, with ongoing analyses during the process. 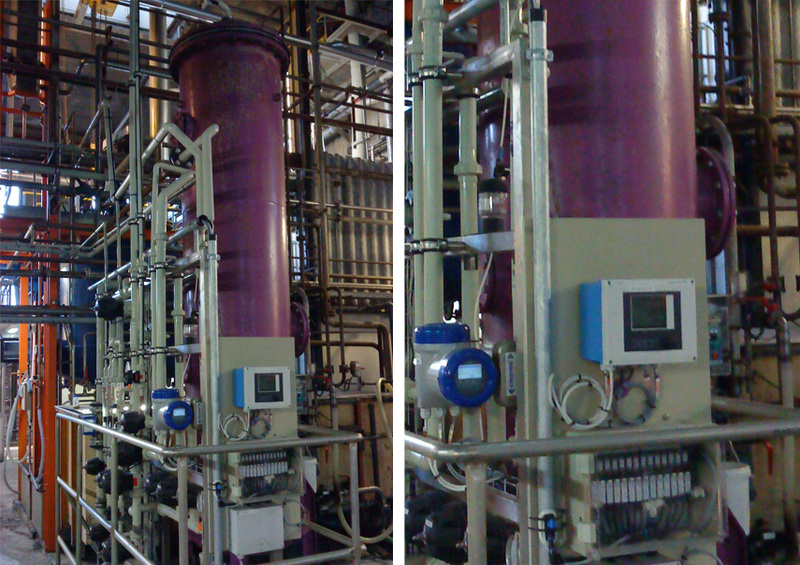 The manufacturing process is automated and the line is dedicated entirely to the production of Hypophosphorous Acid. We manufacture two grades of Hypophosphorous Acid. The technical grade is suitable for applications in the chemical industry, electroplating, etc. The other grade was specifically developed for the pharmaceutical industry and can serve as an active principal, reducing agent or whitening agent. Calcium hydrogen phosphite, a slow release fertilizer and a rich source of phosphorus. Calcium phosphite is a coproduct of sodium hypophosphite and a source of phosphorus commonly used in a fertilizer or pesticide. It has superior properties for these uses than phosphate. Calcium phosphite, CaHPO3, is obtained during the production of sodium hypophosphite. After a first stage where lime, caustic soda and elemental phosphorous are mixed, the calcium phosphite is separated from sodium hypophosphite through filtration, and then dehydrated. Subject to the same quality control as its co-product, our calcium phosphite is extremely pure, and highly concentrated in phosphorous. The phosphite content is minimum 90%, amounting to a P2O5 equivalent of ~45%. The product comes in the form of white powder, conditioned in 900 kg big bags. Calcium phosphite is a source of phosphorus commonly used in the field of fertilizers, for example for green turf for golf. The product is also used as a slow release fertilizer or as a fungicide. The advantage of calcium phosphite is that it is nearly inert. It distills low and constant doses of phosphate to the plants, thus requiring 30 to 50% less phosphite than phosphate to obtain similar yields. Since its integration into the ecosystem is slower and the quantities released are lower than with a phosphate treatment, the level of phosphate released into the waterways is extremely low. A leader on the electronics markets, Febex offers two ranges of high purity products. Electronics is Febex’s main market, thanks to its dedicated products of the highest purity and its long-standing expertise. Our high technology equipments, such as the clean room, position us as the leader on the European markets. 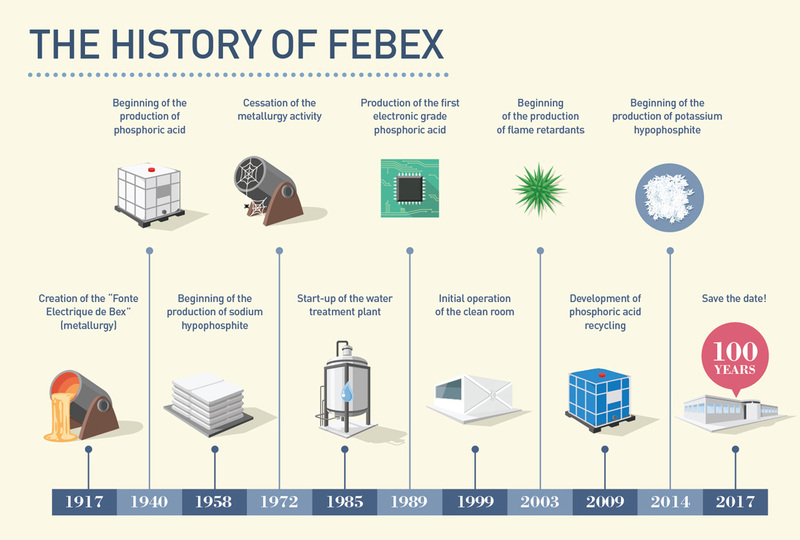 In 1989, Febex produced its first electronic-grade phosphoric acid. Benefiting from 25 years’ experience, analyses and development, we have acquired world-renowned expertise in the electronics sector. Febex developed its range of products to cater to the specific requirements of its markets. The production of phosphoric acid is made up of different steps, resulting in different qualities depending on the application. Electronics requires the highest possible purity, especially in regards to metals such as iron. Several purification steps ensure that impurities do not exceed the level of the ppb. The production unit of the electronic grades is situated in a dedicated building. Processing takes place in a clean room and is monitored by a particle counter. 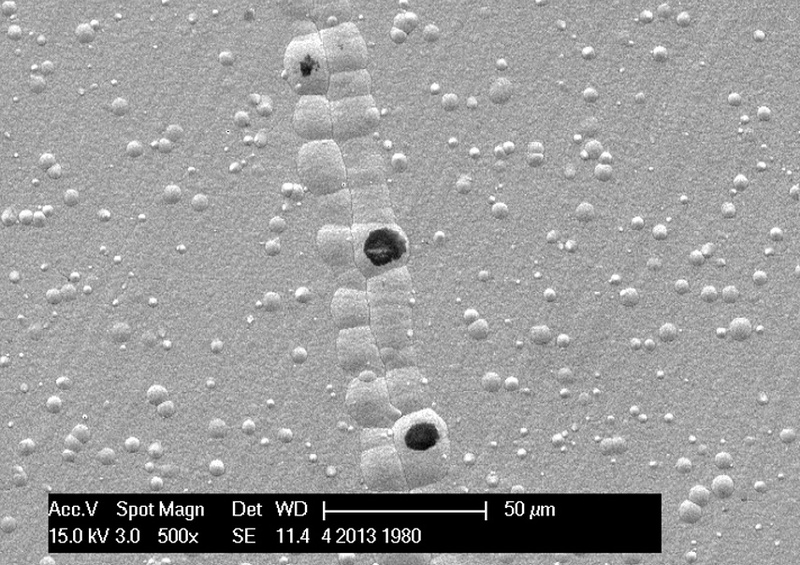 Any form of exterior contamination is thus excluded throughout the production chain. The choice of production equipment is strategic to prevent contamination by metals, particularly iron, chrome, or nickel, or by alkalines. 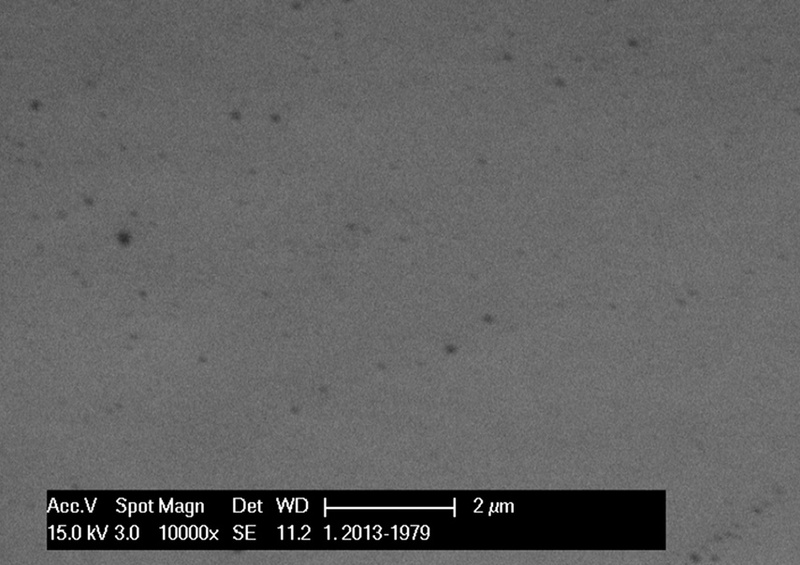 Superbex, with an iron content below 2 ppm, is mainly used in first generation electronic equipment component production plants and in the TFT-LCD screen industry. 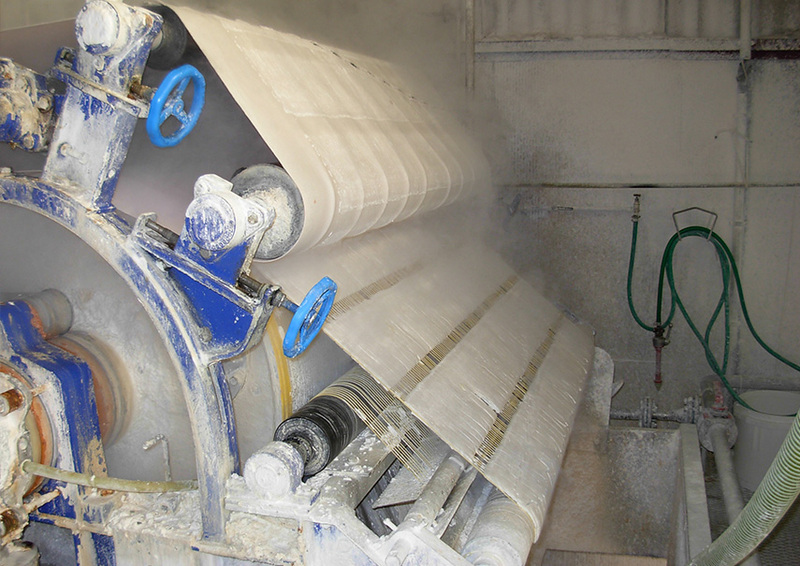 Ultrabex is electronic-grade with ultra-low iron contents: from 200 ppb (IC200) to 50 ppb (IC50). With minute traces of impurities and stringent analyses, Ultrabex is ideal for applications requiring an extremely high purity and particle control, such as the manufacturing of electronic microchips. Sodium hypophosphite, marketed under the brand Sofibex, is produced from a mixture of lime, caustic soda and phosphorus. The quality of the finished product depends on the strict sourcing of the raw material. The production line is exclusively dedicated to the manufacturing of Sofibex. Febex is the only producer outside of China, and its Sofibex is greatly appreciated on the market of electroless nickel plating, especially by the manufacturers of hard disks. 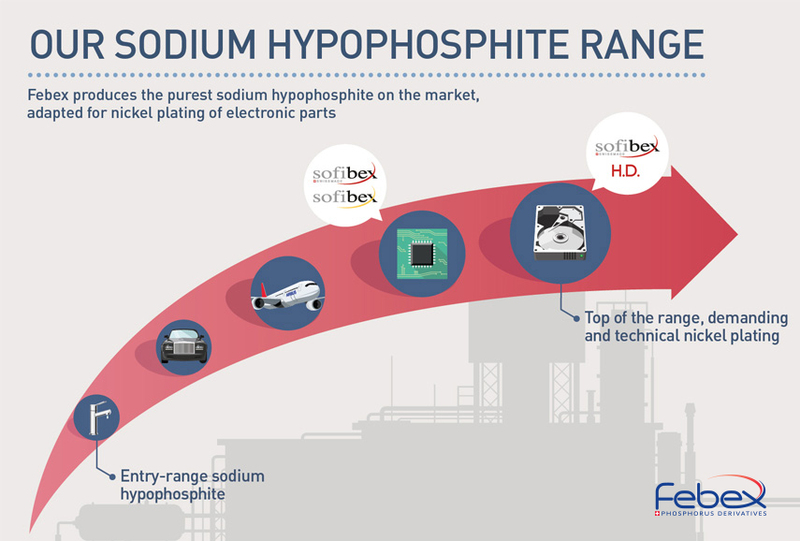 The unique quality of Sofibex Swiss Made enables the incorporation of more than 11% phosphorus in the layer of nickel, rendering it amagnetic. Due to Sofibex’s excellent solubility, the nickel plating is homogeneous and completely amorphous, ensuring an extremely efficient protection against corrosion and heat. As experts on the electronics market, we are able to cater to the specific requirements of each application. 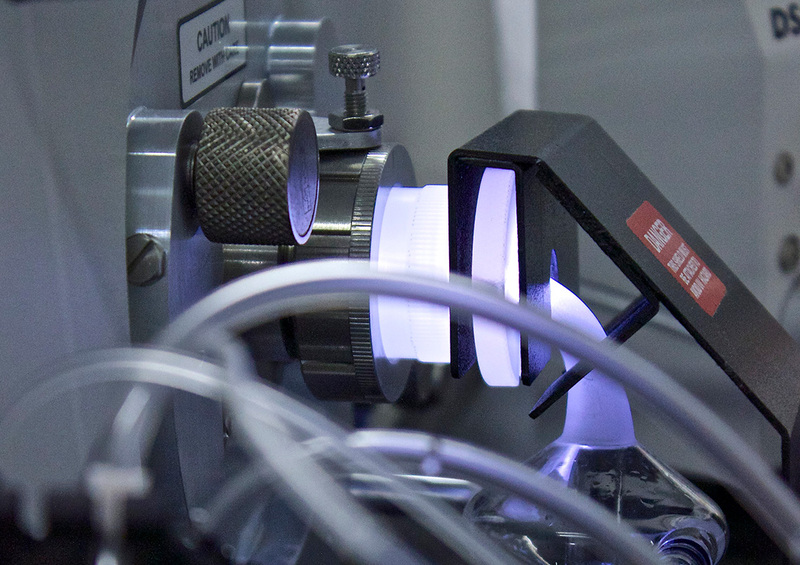 This knowledge, along with our expertise, has enabled us to develop a Sofibex HD grade suitable for the chemical nickel-plating of hard disks. Sofibex is conditioned in 25 kg bags, or in big bags of 500 kg and 1 000 kg. 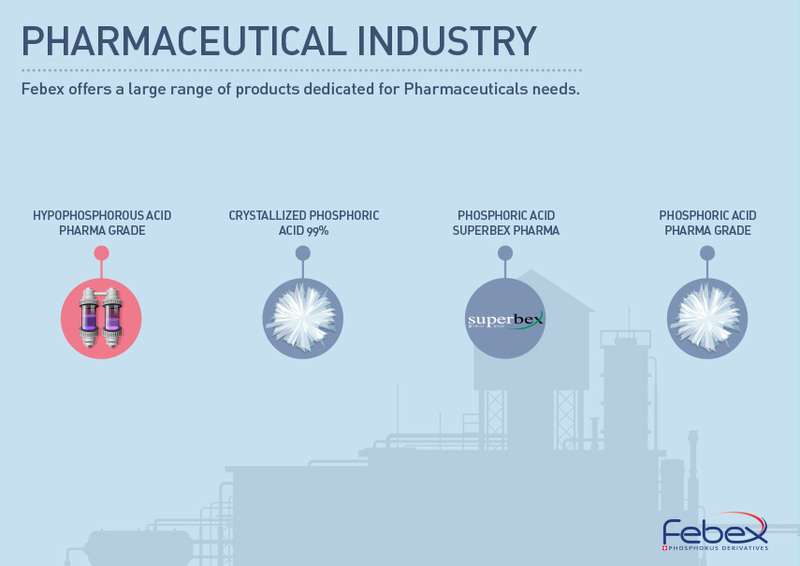 With its specialty products, Febex is expanding on the pharmaceutical industry market. Always seeking innovation, Febex has expanded its range by developing phosphorus products, which are adapted to the specific requirements of the pharmaceutical industry. With its tailor-made solutions, the applications in the industry are wide and diverse. Febex guarantees the traceability of its products in accordance with ISO 9001. With its history in the electronics market, Febex’s expertise and state-of-the-art equipment allow it to meet the rigor that is essential in the pharmaceutical industry. Conditioning in a clean room excludes all external contamination. Our production lines are exclusively dedicated. Our laboratory is equipped with measuring devices enabling us to identify the presence of 36 elements. Furthermore, with our database, we record more than 20 years of statistics on the quality of our products. This enables us to suggest customized specifications, aimed to meet the individual requirements of our clients who seek a turnkey solution. Our products are also frequently used in the cosmetics industry. The purity of our products is one of the key elements for the pharmaceutical industry. 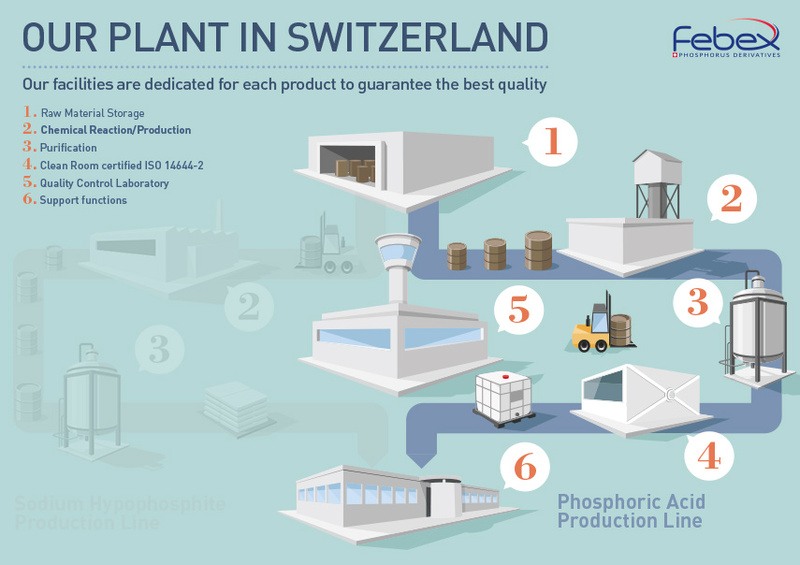 The reliability of the supply guaranteed by our company, based in the heart of Europe, makes Febex the choice provider for phosphorus derivatives. Febex is certified ISO 9001, ISO 14001 and OHSAS 18001. We guarantee the traceability of our products throughout the entire value chain. Each production line is dedicated to the production of a single product to avoid all sources of internal contamination. Febex also has its own clean room, ensuring conditioning with zero contamination. 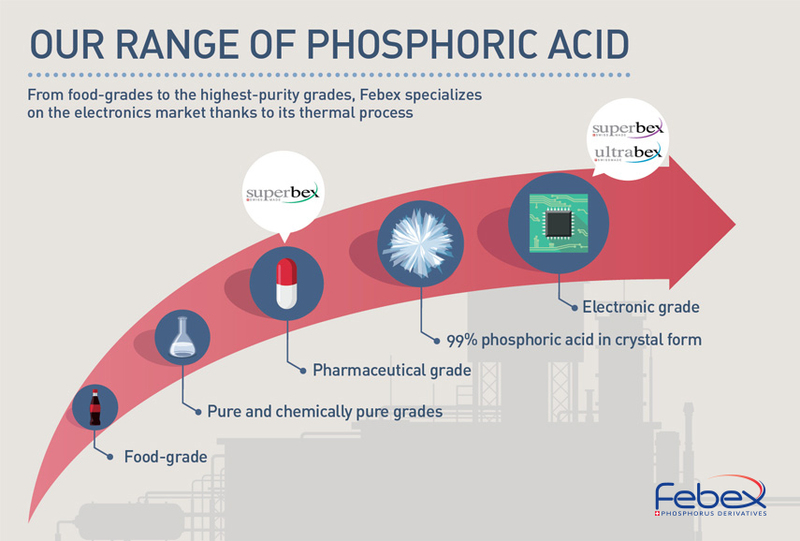 For its phosphoric acid production, Febex uses a thermal process, pledge of quality, followed by several purification steps. 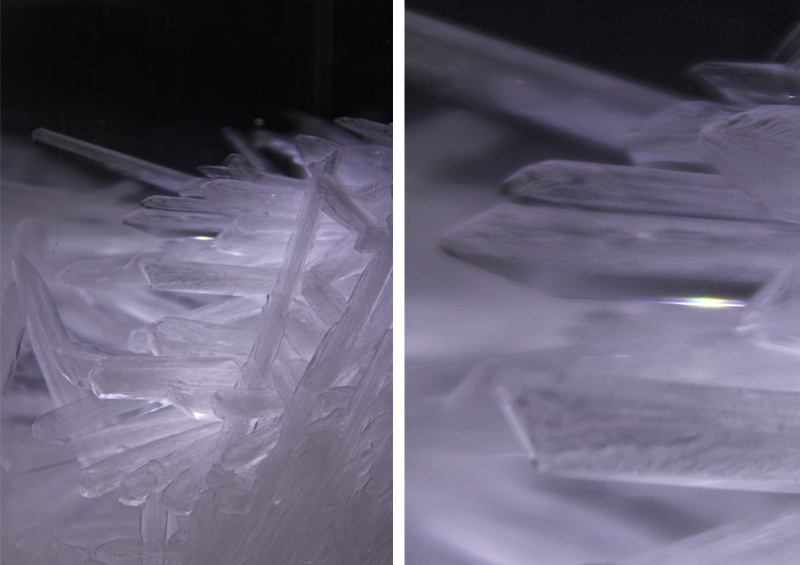 This process enables us to obtain an extremely high purity in our products and guarantee an impurity content of the order of the ppb (1 mg/ton). The different purification steps lead to the products of our phosphoric acid range. The second production line is dedicated to the manufacturing of sodium hypophosphite, which is used mainly in the manufacturing of printed circuit boards, hard discs, and semi-conductors. Sodium hypophosphite is produced by the reaction of phosphorus in a mixture of caustic soda and lime. 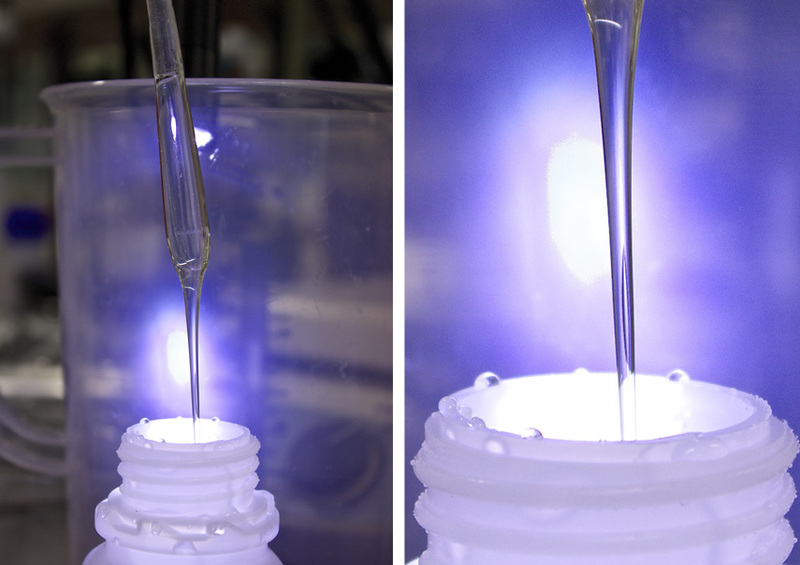 Several purification steps then generate a high purity, very fluid solid. The quality of our products is continuously monitored throughout the entire manufacturing process, by a laboratory implanted within our production lines. Compliant to ISO 9001 standards, it allows complete control of the processes and real-time adjustments to production. Quality is certified by our in-house laboratory, which issues the final Certificate of Analysis. 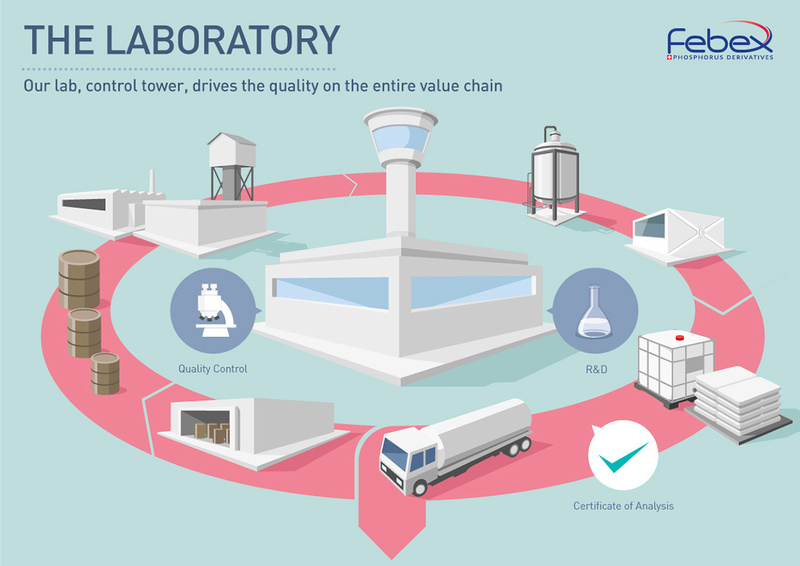 It therefore has the role of control tower of our production plant, since it decides on the release of the finished product. 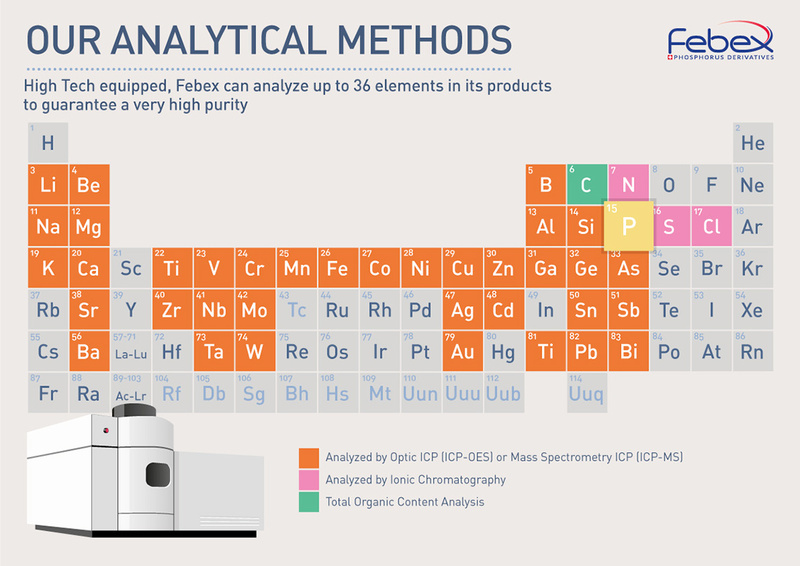 An ICP mass spectrometry allows the analysis of up to 36 elements of the periodic table. 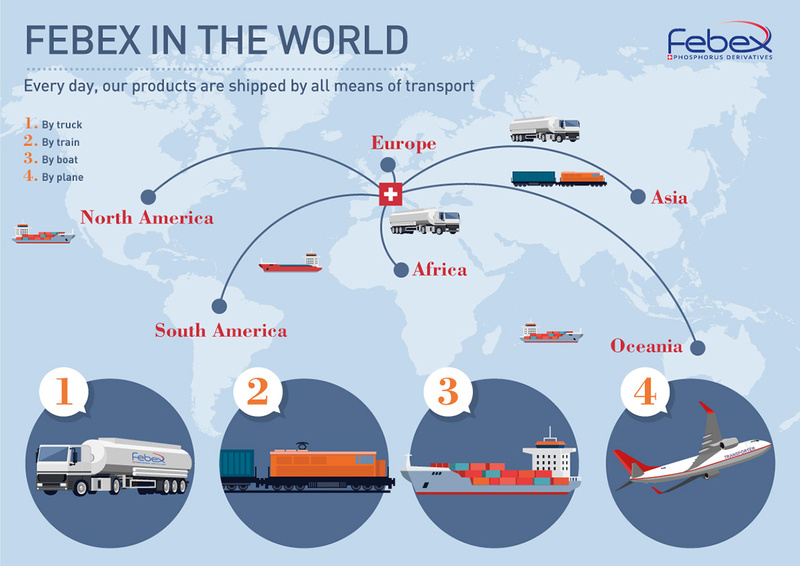 As the only manufacturer outside of China, Febex contributes to the local economy. Our products are adapted to the European markets, particularly in regards to standards. Our company is devoted to ensuring compliance with environmental requirements- in fact, this is one of its key strategies. Since 2006, Febex is certified ISO 14001. However, we do not stop there but anticipate and go beyond the regulatory requirements. 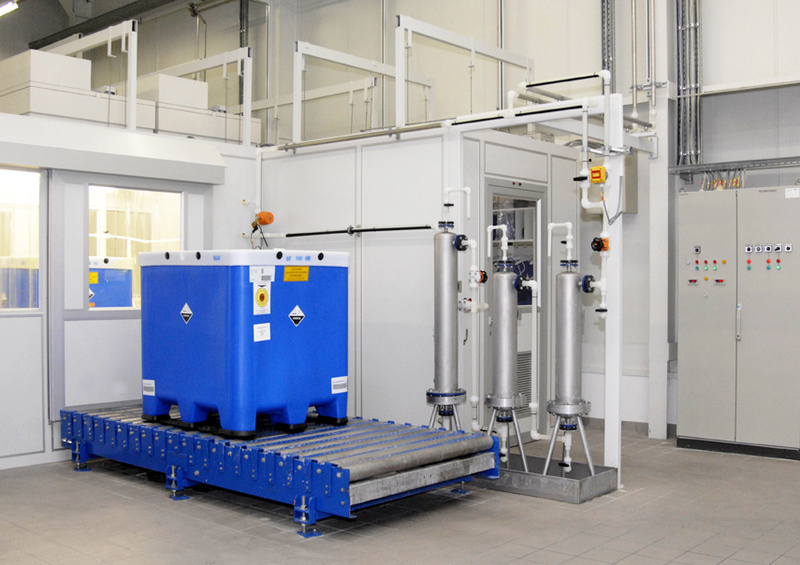 For example, Febex has developed a phosphoric acid recycling unit. 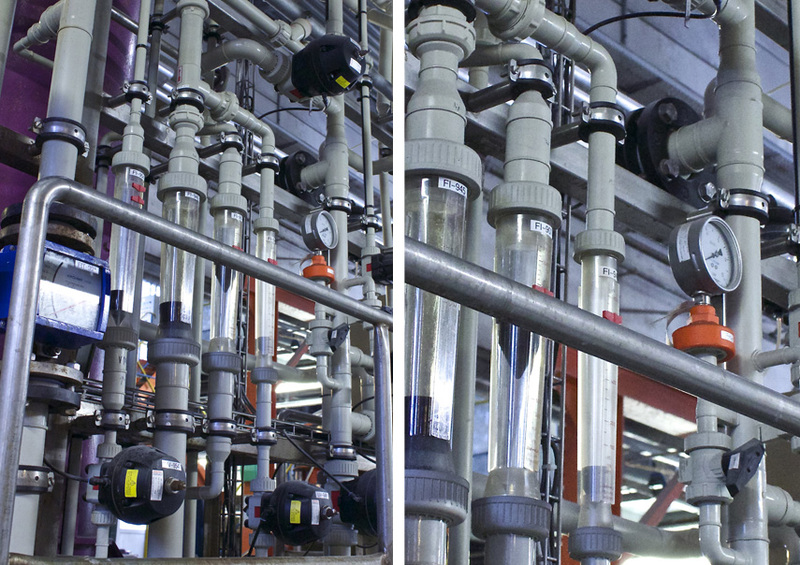 Our process engineers continuously work on improving the functioning of our water treatment plant and optimize the management of our production lines. Febex has implemented a process to reduce its CO2 emissions, mainly by decreasing its energy consumption. By choosing energy efficient equipment, for example, Febex notably reduces its carbon footprint. Elementary phosphorus is the principal raw material of Febex products. It therefore requires specific attention in the management and quality process. It also requires great expertise for its manipulation, since it is an extremely dangerous product and is spontaneously flammable in air. Furthermore, various sourcing methods are essential to ensure the security of supply, which requires great flexibility on the part of Febex. Handling of phosphorus requires extensive expertise and equipment designed to guarantee the isolation of the product from air. 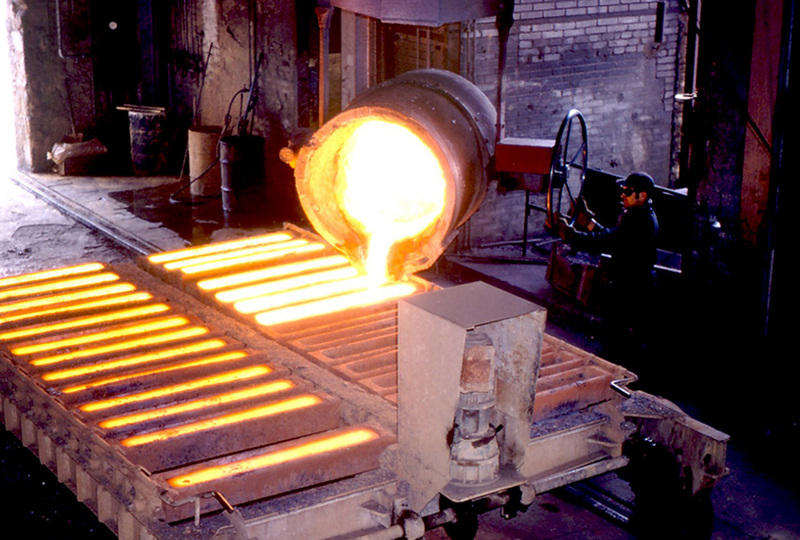 For over 70 years, Febex has received this raw material in 200 kg drums or 25 tons isotanks. 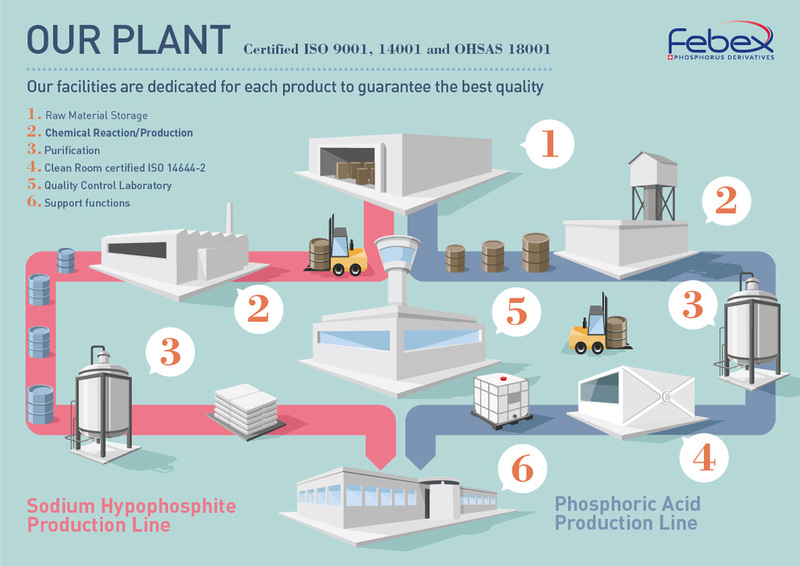 Since it is a raw material for various production lines, the purity of the phosphorus is essential to ensure the quality of our finished products. Suppliers are selected after a rigorous evaluation phase and a systematic quality control. 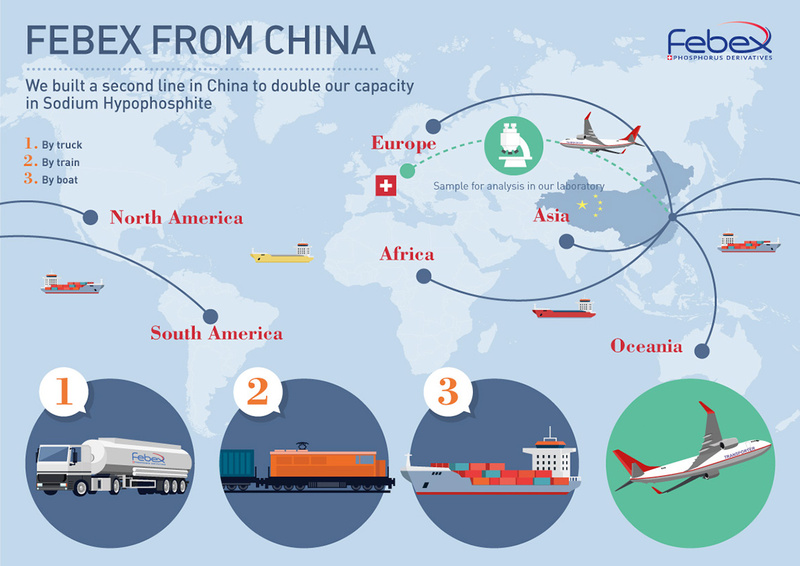 To ensure the security of supply and our production capacity, Febex obtains phosphorus from several specialists, based in various countries, also outside of Asia. The management of these suppliers requires a great deal of flexibility and rigor in the monitoring of the quality. 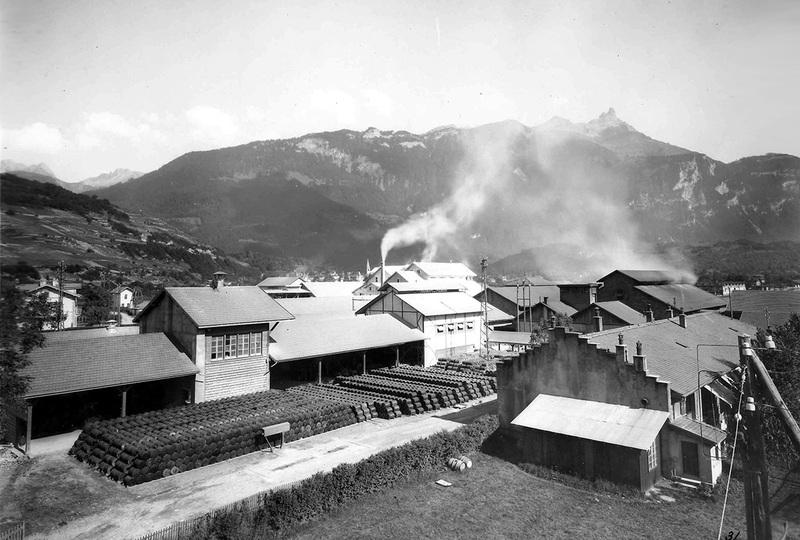 For 100 years, Febex has proved its capacity for adaptation to Swiss and global economic market needs. Today we still anticipate these requirements and are able to put forward proposals for improvement. By investing in innovation each year, we can cater to new requests and establish ourselves on new markets. Febex works in partnership with its clients to support their developments. Febex has strong historic ties with Neuchâtel University. Various PhD have been, or are in the process of being carried out, specifically on the subject of flame retardants. In 2009, Febex was approached by producers of high-voltage capacitors, who used phosphoric acid in the process of electrolytic copper polishing. 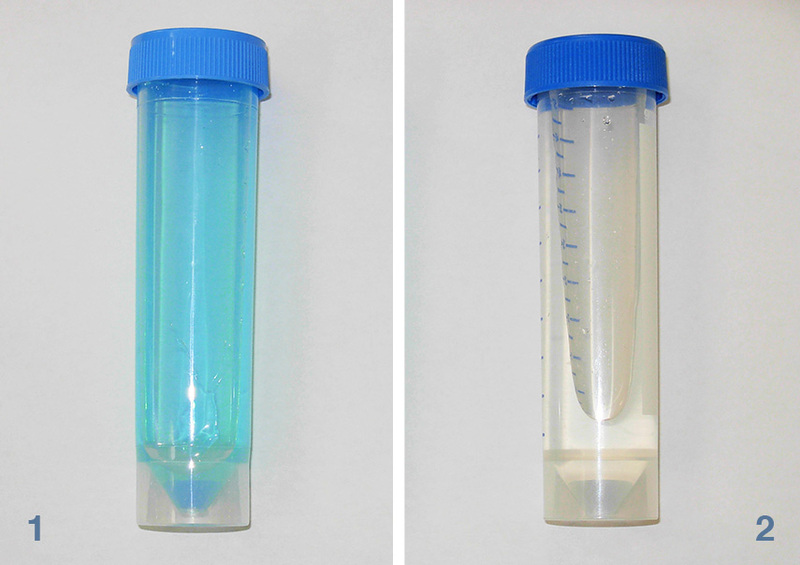 The spent acid is blue and contains ~0.6% of copper (6 kg/to). 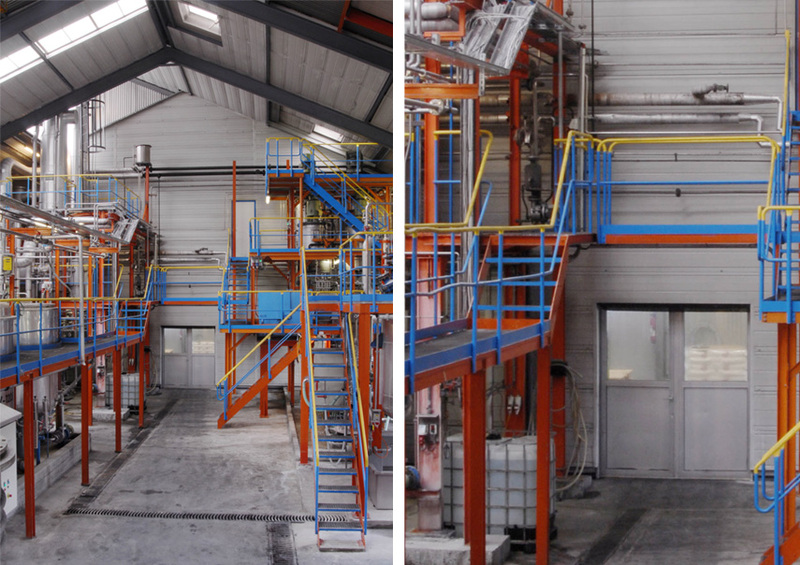 Within a year, thanks to a combination of analytical expertise, production and R&D, Febex was able to offer the client a recycling solution. 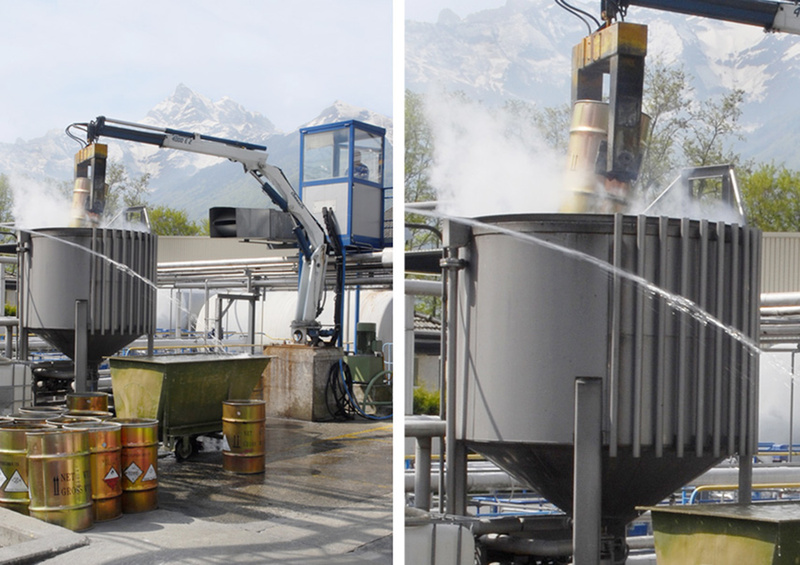 After the recycling process, the acid contains less than 5 ppb of copper (5 mg/to) and is therefore perfectly suitable to be reused in our client’s electrolytic polishing process. 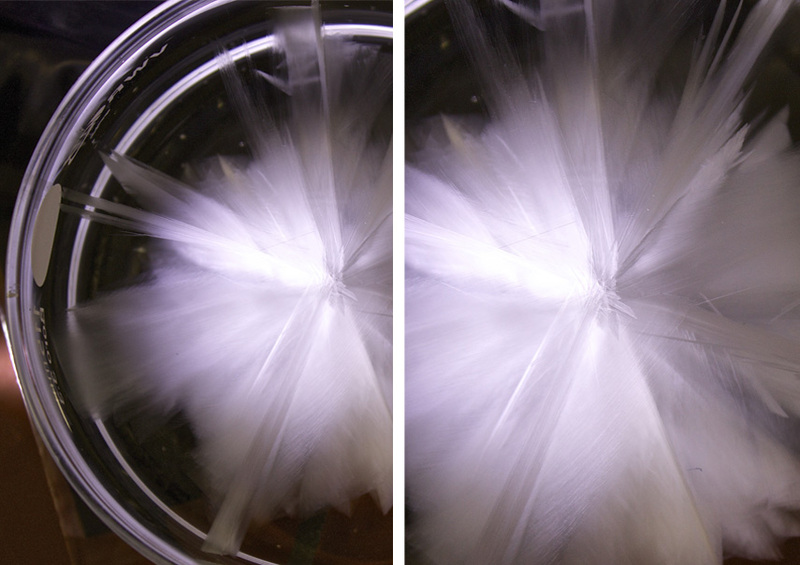 In 2008, Febex explored how to produce an odorless THPS, a key issue in the biocide industry. A new manufacturing process was thus developed, leading to a patent (lien sur le brevet). Reinhard Neier has been a Professor of Organic Chemistry at Neuchâtel University 1991. 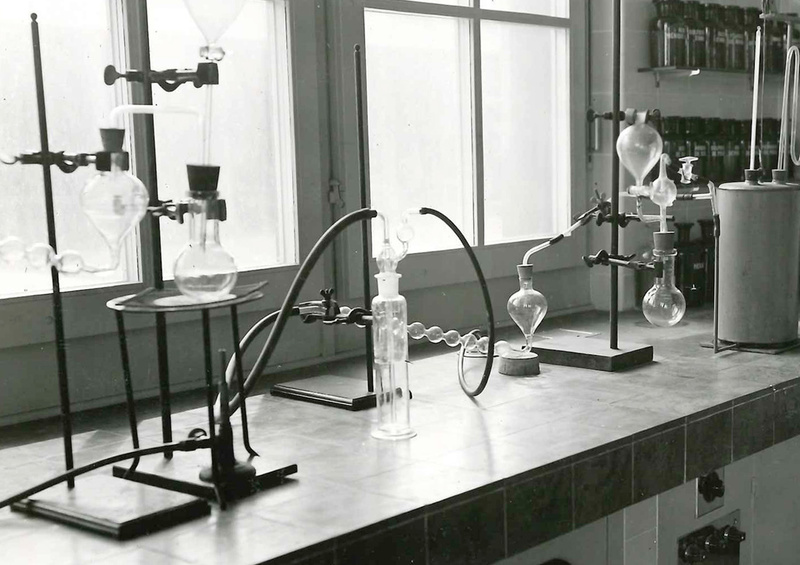 The main focus of his career is research of complex molecules in organic synthesis, which is intimately linked to the fundamental processes of life. Professeur Neier is greatly invested in the university and scientific community. It is crucial for him to center his activities on the education and the professional future of his students. The success of this collaboration is a great example of university-industry combined research. The expertise and knowledge of each party were extremely complementary and encourage us to continue/renew this experience.